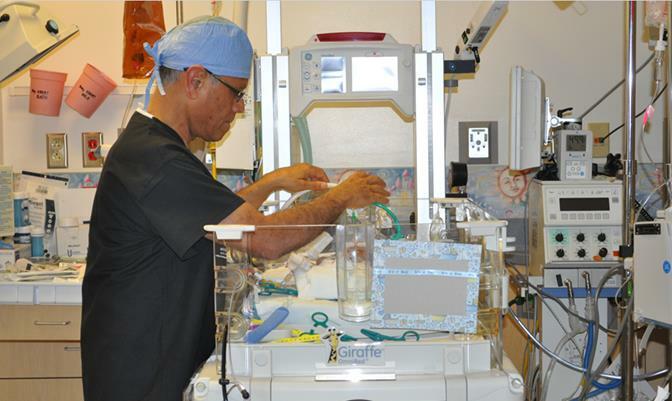 LANCASTER — The Antelope Valley Hospital Neonatal Intensive Care Unit (NICU) recently marked 30 years of service to the community. AVH also recognized the NICU’s Medical Director, Murugesa Thangavel, M.D., a neonatologist who has been caring for the Antelope Valley’s tiniest patients since the NICU opened in 1984. Thangavel has watched with pride as the NICU has grown from two small rooms when it opened into its own wing with 21 licensed beds and 15 Giraffe Omnibeds today. The level 3b NICU in the Women and Infants Pavilion has an average daily census of 19 and a staff of 92. The national rate of preterm births is 12% of all live births, while AVH’s rate is 9%. More than 12,500 babies have been cared for in the NICU over the past 30 years. 4 comments for "AVH Neonatal Intensive Care Unit celebrates 30th anniversary"
Thank you, for your caring and excellent services, I have had two of my grandchildren taken care of by you, and friends babies, you care has been top quality! Thank you goes out to the Dr.s and the dedicated wonderful nurses! It’s been 10 years since my daughter was born at 26 weeks weighing only 1 lb 10 ounces. I am so grateful to Dr. Thangeval, Dr. Kumar, and all the nurses. They are so dedicated and caring. I was so sad when Dr. Kumar, passed away he had helped so many families. I thank God for my daughter and I know he worked through everyone in the NICU. Bless all of you. My son was born at AVH…I went into ER because I was bleeding. I was about 19 weeks into my pregnancy and water broke. I stayed in hospital till I was about 27 weeks, then he came. He was 2lbs, he stayed for 3 months and he was ready to come home. Dr Thangavel took great care of my son is going to be 18 in Aug….. he is great 3.0gpa…cross country runner…ROTC opps…wrestling…break dancer…track…and he is becoming a great man of God!!!!! THANKS Dr. Thangavel GOD BLEES YOU!!!!!! I gave birth to ID twin boys in June of 2000 at 29 weeks. They weighed 3Lbs 1/2ounce and 3Lbs 1ounce. You and your team saved my babies. They are now 13 1/2yrs old and 6 foot tall 190Lbs and 5’6 and 145Lbs. They are great and without you I truly believe I wouldn’t have these healthy blessings. Seems like such small words but it’s all I can say THANK YOU! !